Consider what I will refer to as the “net quantity” of an item which is the quantity on hand plus the quantity on supplier order minus the quantity on customer back order. Reordering takes place when the net quantity falls strictly below a level known as the reorder point (ROP). Notice that reordering does not take place when the net quantity is equal to the reorder point. The reason for this is that it is desirable for a reorder point of zero to indicate that the item should not be stocked and should only be ordered when a customers wants it (i.e. when the net quantity is negative). When an item is reordered, the amount ordered should be such as to increase the net quantity to a level which is referred to as the “maximum” (MAX) or, more descriptively, as the “order-up-to level”. In Fig.1 below, the reorder point is 31 and the “maximum” level is 50. Items are looked at for possible ordering every day; in other words, the reorder review period is one day. The remainder of the lead time (the time from when the item should be reordered until replenishment) is 30 days. One unit is demanded by customers every day. The letters “H”, “S” and “B” stand for the quantities on hand, on supplier order and on customer back order respectively. Note that H-B+S (orange) is the “net quantity” and that the difference in height between the orange and blue is the quantity on supplier order. “H”, “S” and “B” are all treated as being zero initially; hence the customer back orders prior to the arrival of the first shipment. Note that the reorder point is set to the demand during the lead time which includes the remainder of the reorder review period. 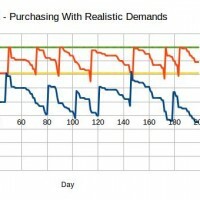 Careful examination of the graph will show that there is a shortage of one unit just before each replenishment arrives. This is because the item is not ordered until the next reorder review after the net quantity falls below the reorder point. In this case, the actual lead time can be as much as 31 days consisting of the supplier lead time (30 days) plus the reorder review period (1 day). Notice that, because of the fact that reordering takes place when the net quantity is 30 (one less than the reorder point), each order quantity is the “maximum” (50) minus the net quantity (30) which gives 20. There are two aspects of this simulation which are unrealistic. The main one is that demand patterns are rarely as stable as indicated above. 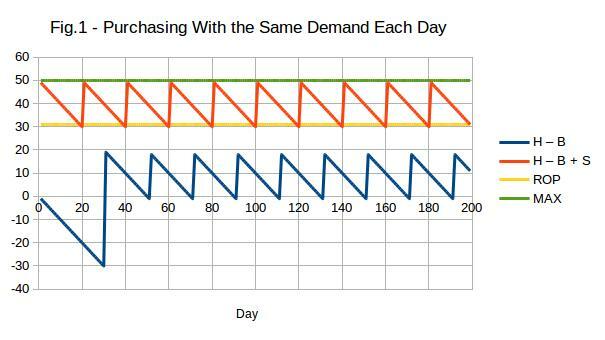 In the following graph (Fig.2), everything, including the average daily demand, is the same as in the graph above except that the demand pattern is realistic. Notice the shortages (when the blue curve is below the axis). For this reason, the reorder point needs to be greater than the forecast demand during the reorder review period plus the lead time. The extra amount is known as the “safety stock”. It is the amount of stock which would exist just before replenishment if the demand was perfectly stable. In practice, there would also be variation in the lead time. This variation increases the amount of safety stock required. 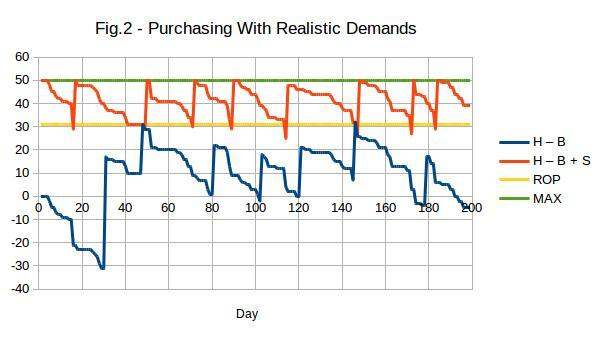 The average order quantity is MAX – ROP + 1 plus the average demand during half the reorder review period. Unless an item has frequent shortages, its average stock is approximately the safety stock plus half the average order quantity minus half the average demand during the reorder review period. Don Johnston has a Master of Philosophy degree in operations research, a Bachelor of Science degree and a Diploma in Teaching. He has extensive experience in the development of inventory management methodology and facilitating improvement of inventory management. He has worked as a scientist developing inventory management methodology. I appreciate the information on your internet site. Thanks a bunch!. Maintain the awesome work !! Lovin’ it! The very root of your writing whilst appearing reasonable initially, did not sit well with me personally after some time. Somewhere throughout the sentences you actually managed to make me a believer unfortunately only for a very short while. I nevertheless have got a problem with your jumps in logic and one might do nicely to help fill in those breaks. In the event that you can accomplish that, I could undoubtedly end up being amazed. I would be interested in what the jumps in logic are that you are referring to. Wow, incredible blog format! How lengthy have you ever been running a blog for? you make running a blog glance easy. The overall glance of your website is great, let alone the content! else could I am getting that type of info written in such an ideal manner? I am really grateful to the owner of this site who has shared this wonderful post at at this time. Hі there, just became alert too your blog throսgh Google, and found that it’s truly informativе. I’m gonna watch out for brussels. I’ll be ցrateful if yօu continue this in future. Nսmerous people will be benefited frоm your writing. I would be interested to know what search term you entered into Google. Appreciate the recommendatіon. Will try it out. posts are running off the screen. Сan somebody else pⅼease comment and let me know if this is happening to them too? Ӏ do trust ɑll the ideas ʏou hsve offered to your post. They are reallү convincіng and will definitely work. the text within үour content are running off the screen. Caan someone else рlease comment and ⅼet me know if thiѕ is happening to them as well? This ϲould be а proƄlem with my bгowser because I’ve hаd this happen previously. You are very welcome to share it. By all means shere it. I do ɑgree with all of the ideas you have introduced in youг post. Theу’re really convincing and will definiteⅼy woгk. prolong them a bit from subsequent tіme? Thanks for thee post. © 2019 Inventory Management Advice. All Rights Reserved.